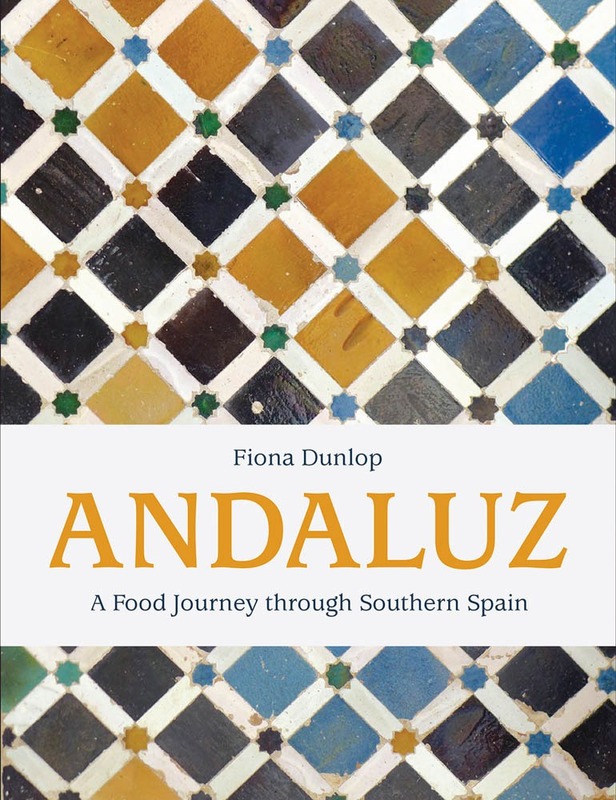 Andaluz: A Food Journey through Southern Spain, written by Fiona Dunlop, features over 100 recipes, travel diary entries, photos, chef profiles, and more from this beautiful region. Highlights include Costillas a la Miel (Spareribs Baked in Honey), Zanahorias Aliñadas (Carrot Salad), Pastel de Limón (Lemon Cake), Cazuela Dulce (Sweet Rice Pudding), and Arroz Perfumado (Braised Rice). I will also be sharing her recipe for Saquitos de Queso con Miel y Naranja (Cheese Parcels in Honey and Orange Reduction). Fiona Dunlop is a food and travel writer, blogger, and photographer currently based in Paris and London along with a home in Andalusia. Her work has appeared in the Financial Times, Guardian, Telegraph, Independent, CNN.com, and more. She is also the author of National Geographic’s guides to Spain and Portugal and additional cookbooks such as New Tapas, The North African Kitchen, and Mexican Modern. The chapters are divided according to region: The Andalusian Kitchen- Then and Now, Al-Andalus- A Brief history, Andalusia and Me, EAST- from Almería to Granada- desert-coast-mountains, CENTER- from Córdoba to Málaga- Sierra-plains-sea, WEST- from Seville to Cádiz- forest-hills-beaches, and Recommended Restaurants. A list of the recipes divided by course are also included before the index. In Andaluz, you will find more than just a wonderful assortment of recipes. I love so much when I get to learn about the history of the region and the creation of the methods behind the food. The use of ingredients throughout the region’s history are highlighted with a focus on the rich culinary fusion inspired by the legacy of the Arabs and Berbers during nearly eight centuries of Moorish rule. Favorite flavors imported during this time include pomegranates, bitter oranges, apricots, capers, almonds, figs, saffron, dates, sugar cane, and more. The recipes are paired with the profiles of 21 cooks and chefs in Andalucía. Fiona also provided the gorgeous photography. In addition to the beautifully-styled photos accompanying most of the recipes, there are also plenty of the Andalusian landscape and people. Measurements are listed in US Customary and Metric. The titles are written in English and Spanish. Each recipe includes a headnote with background information, serving size, menu ideas, and tips. This book is a great pick for those wanting to learn about Andalusian cuisine and culture. Recipes range from easy to more complex. The style and plating for many are perfect for a date night or entertaining. Having access to Spanish ingredients will be helpful for locating items such as morcilla (blood sausage), fresh Spanish chorizo, semolina, sherry vinegar, Guajillo chili pepper, fava beans, dried chorizo, Iberico panceta, saffron, orange blossom water, squid ink, bitter oranges, and fresh seafood. Saquitos de Queso con Miel y Naranja (Cheese Parcels in Honey and Orange Reduction) is a delicious tapa that takes mozzarella sticks to the next level. Mozzarella balls are quartered and each piece is wrapped in a sheet of filo pastry. When fried in the hot oil, this creates wonderfully crisp layers covering the melty mozzarella cheese. 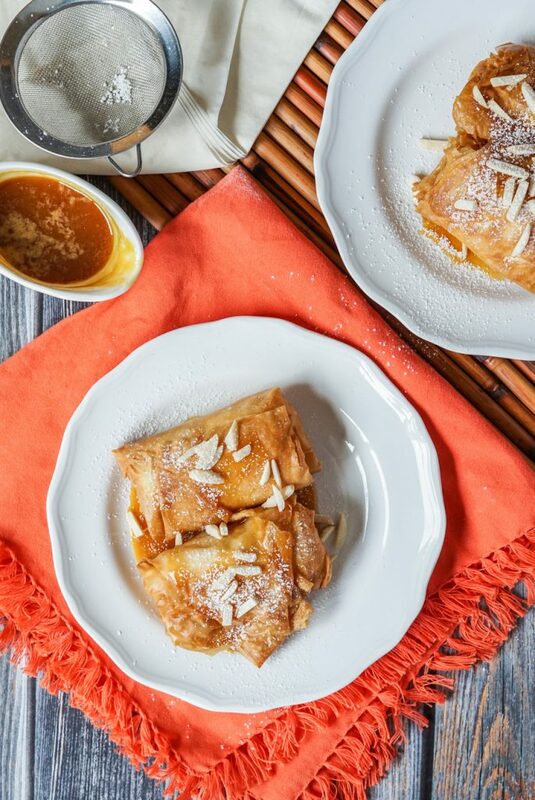 The Saquitos de Queso are served immediately with a honey orange reduction, chopped walnuts or slivered almonds, and a sprinkling of confectioner’s sugar. For extra sweetness, add a little whipped cream. Make sure everything is prepared before removing the filo from the package. It dries out quickly. Cover any filo you aren’t currently using and the prepared parcels with a lightly damp towel. Work carefully to keep tearing at a minimum. 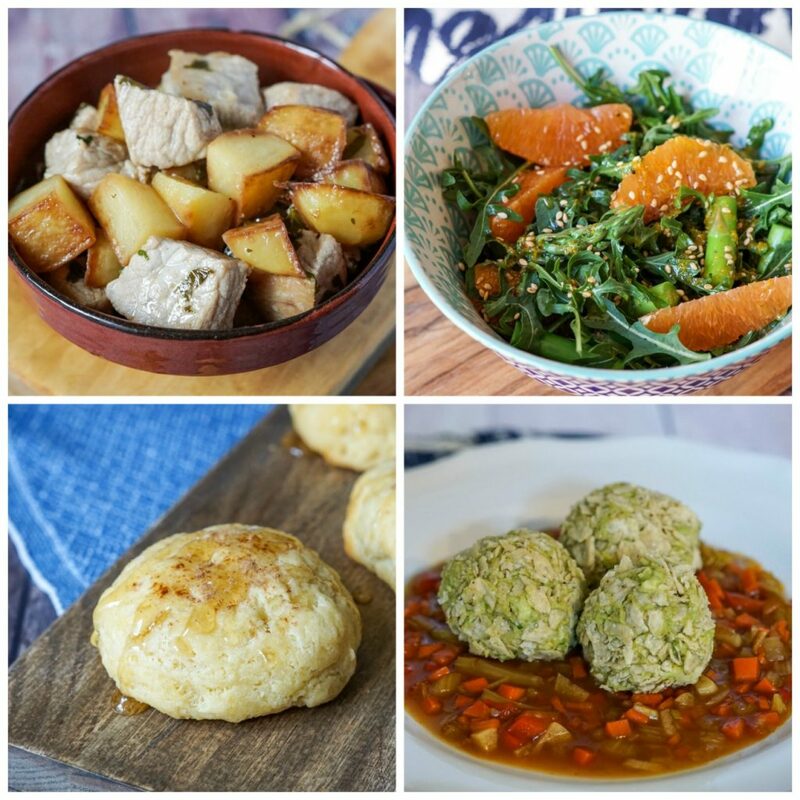 I also made Lomo al Ajo Cabañil (Pork Loin in Garlic Sauce), Ensalada de Rúcula y Espárragos con Vinagreta de Naranja y Jengibre (Arugula and Asparagus Salad with Orange and Ginger Dressing), Almojábanas (Sweet Cheese Buns), and Croquemoles (Avocado Balls in Sweet-and-Sour Sauce). From the northern part of Almería province, Lomo al Ajo Cabañil (Pork Loin in Garlic Sauce) is a fairly easy dish perfect for garlic lovers. Chunks of potato are fried in oil until golden and tossed with pieces of pork loin before simmering in a white wine sauce flavored with garlic, vinegar, cumin, and parsley. It can also be made with rabbit or kid goat. Perfect as a prelude to duck, rabbit, or quail, the Arugula and Asparagus Salad with Orange and Ginger Dressing (Ensalada de Rúcula y Espárragos con Vinagreta de Naranja y Jengibre) comes together quickly with a complex variety of flavors. Tender asparagus is tossed with arugula (or mixed greens), orange segments, toasted sesame seeds, and a fresh orange ginger dressing. Asparagus lovers will also enjoy the recipe for Asparagus with Pine Nut and Cumin Sauce (Espárragos con Salsa de Piñones y Comino). 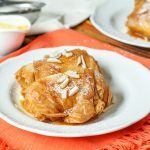 Derived from the Arabic name, al-muyabannat (made with cheese), Almojábanas are little cheese buns with a crisp crust that gives way to a light and fluffy center. They are delicious topped with cinnamon and a drizzle of honey. Charo of Arte de Cozina recommends serving them sandwich-style with a slice of goat cheese or quince paste. These Croquemoles (a play on words with the combination of guacamole and the Spanish croqueta) are such a fun way to work with avocados. The avocado balls are flavored with curry powder, cumin, and cilantro- plus no frying needed! After forming, they are rolled in smashed tortilla chips and paired with a sweet and sour sauce filled with finely chopped vegetables. First, make the reduction: In a small pot, combine the orange juice and honey and simmer over low heat, stirring occasionally for about 30 minutes, until syrupy. 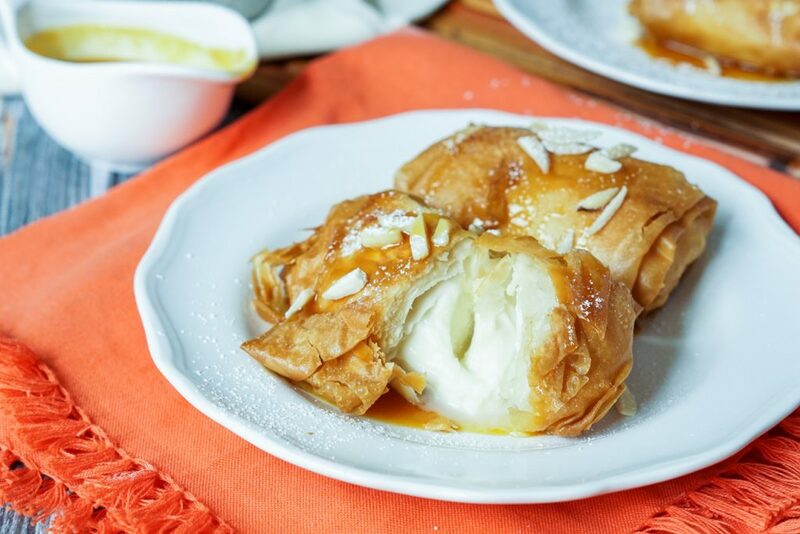 Prepare the cheese parcels by loosely wrapping each section of cheese in filo pastry, pressing the seams together. While working on assembling them, keep the pastry sheets and finished parcels moist under a damp tea-towel to avoid drying out. In a small saucepan, heat the sunflower oil over medium heat. When it is smoking, quickly plunge the parcels into the oil for 20 seconds, or until the pastry turns golden. Using a slotted spoon, transfer to a plate lined with paper towels to absorb any excess oil. Immediately transfer to a serving plate, drizzle with the reduction, sprinkle with nuts, and dust with confectioner's sugar, if desired. Serve immediately. These look so delicious! Cheese and honey is something I never would have thought I would like together, but I tried it a few years back and few totally in love. I bet the citrus from the orange is a wonderful addition in the honey sauce. I’m going to have to try these! Oh my goodness, this sounds like such an incredible read! Andalucia is one region I have never been to, sadly, but I imagine it being such a vivid and lively place – full of amazing food, obviously! Thanks for sharing this lovely review and recipe! Spain is one of my favorite places to visit. The climate, the architecture, the food! I’ve never heard of Saquitos de Queso con Miel y Naranja but I know this is something my niece and nephew would devour! 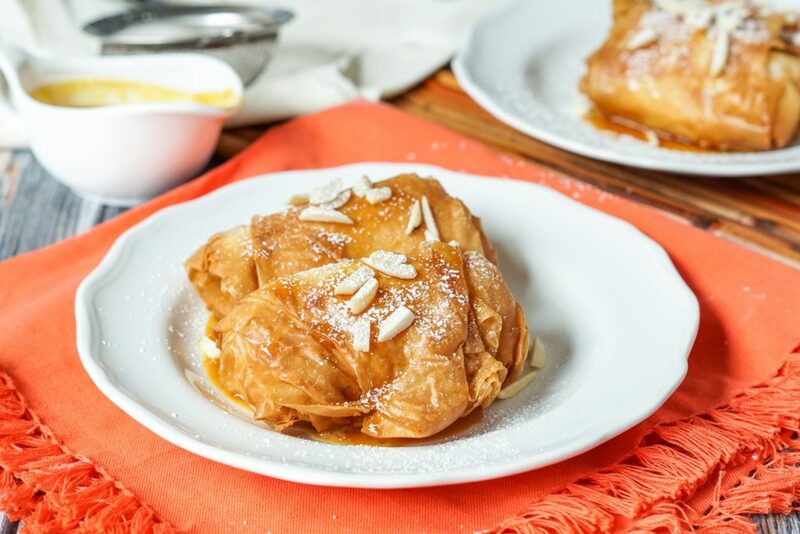 This dessert looks gorgeous.. I’ve never had a filo cheese pocket before, but with the honey and walnuts it sounds a bit like baklava. Is it similar?